Emancipated in the IPL, Incorporated in the national team! The selectors met yesterday to announce the teams for two upcoming tours. India will once again tour Zimbabwe for a limited-overs series post-IPL and then go to West Indies to play the test matches. Because test cricket came on the scene first, let us discuss it before moving to the limited-overs leg. The Indian team under Virat Kohli is set to go on a long expedition of around 14,000+ km. The 4-match test series in West Indies will be India's first test series after the one they played against South Africa in October-November last year. The selectors have continued with the trend of selecting a 17-member squad. Over the last six months, only two changes have been done. Uncapped Shardul Thakur comes in for Varun Aaron and Gurkeerat Singh Mann has made way for Mohammad Shami. 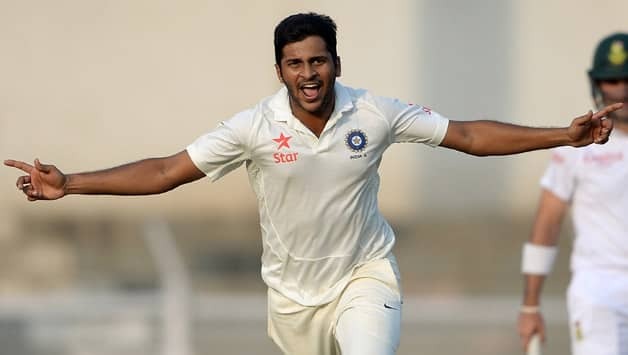 Shardul Thakur is the sole new face in the test squad. For most of you, Shardul Thakur must be an obscure name. Rightly so. In an era where cricketers are more recognized from the acclaimed Indian Premier League than the conventional Ranji Trophy, such scenes are bound to happen. The 24-year old right-arm medium pacer plays for Mumbai in the Ranji Trophy. He was the joint highest wicket-taker parallel to R Vinay Kumar in 2014-15. His 48 wickets in 10 matches came at an average of 20.81. In the following year, his 41 wickets were crucial in Mumbai's Ranji Trophy triumph. In all, Thakur has 133 wickets to his name in 37 first-class matches at an impressive average of 27.53. But the question which arises is where was Thakur in the IPL? 'On the bench of Kings XI Punjab' is the answer. Another question which arises is that if Kings XI Punjab finished last in the league stage, why wasn't Thakur given a chance? The answer being that the latter was released by the franchise midway through the tournament. Cricket is a funny game. Form a picture of this situation yourself. The guy was given a sole match in two full IPL seasons. And here, he is a part of the national squad. You may call it as the irony of life. You may call it as the mindset of the think tank of Kings XI Punjab, who perhaps did not find the horse in Thakur for T20's course. The rest of the squad comprises of seven specialist batsmen in Virat Kohli (C), Murli Vijay, Shikhar Dhawan, Lokesh Rahul, Ajinkya Rahane (VC), Cheteshwar Pujara and Rohit Sharma and a sole wicket-keeper in Wriddhiman Saha. Ravindra Jadeja and Stuart Binny have been included for their dual abilities. R Ashwin and Amit Mishra are the spin twins to go with the five fast bowlers, namely, Ishant Sharma, Mohammad Shami, Bhuvneshwar Kumar, Umesh Yadav and Shardul Thakur. The series will also be a platform for Shami to stage an international comeback. The latter was included for the tour of Australia but was found wanting in front of injuries. He was again involved in the team for the ICC World Twenty20 2016 but saw the tournament from the bench itself. The playing might remain the same as the one which played in New Delhi against South Africa with just one change, an extra pacer coming in for Rohit Sharma. Let us now shift our focus to the limited-overs squad which will tour Zimbabwe next month. Resting the senior players and including some younger ones was always on the cards. But one thing of uttermost importance would be the man leading this young side. Who better than Mahendra Singh Dhoni would the rookies look up to at this point in time? The time has played it's part over the years. In 2010, India toured Zimbabwe under Suresh Raina. In 2013, Virat Kohli was the leader of the side. In 2015, Ajinkya Rahane was given the lead role. All these times, Dhoni was rested now when the tables have turned, all these players have been rested and Dhoni will board the plane to Harare. The tour will also be his first as captain in Zimbabwe. The fact that Dhoni does not play the longer format of the game now has more to do with him leading this side. India is scheduled to play limited limited-overs cricket this year. In such a scenario, the selectors and Dhoni himself would want to play in as many international matches as possible. The selectors have chosen a 16-member squad which includes as many as six uncapped players in the limited-overs format. Lokesh Rahul, Faiz Fazal, Karun Nair, Mandeep Singh, Yuzvendra Chahal and Jayant Yadav are the newbies. Lokesh Rahul deserved a place in this side, especially when he had proved his limited-overs credentials in the ongoing IPL with 386 runs in 12 matches at an average of 55.14 and a strike rate of 147.89. The left-hand batsman from Vidarbha, Faiz Fazal has been a turn up for the book. The 30-year old, who was without a current IPL contract, has been given a reward for his strive over the last decade. His innings of 127 for Rest of India (while chasing a historic 480) against Mumbai in this year's Irani Trophy was instrumental for him in getting this opportunity. Lokesh Rahul would be looking to score big in the ODIs as well. Karun Nair is another of those batsmen who was knocking the doors of the national team for quite some time now. The 24-year old right-hand batsman was sent as a replacement to Sri Lanka in the test series last year but did not make it to the playing eleven. The graceful batsman has not only left a mark in the IPL but has been scoring consistently in the Ranji Trophy as well. Just like Shardul Thakur, Mandeep Singh has also spent this IPL on the bench but has gained from true to type performances in the domestic circuit. He was the highest run-scorer in the Vijay Hazare Trophy, with 394 runs in seven matches. Apart from getting the Purple Cap in RCB's last league match, Yuzvendra Chahal has now managed to get into the national side as well. The 26-year old right-arm off-spinner, Jayant Yadav also comes from Haryana (just like Chahal) and has been given a bounty for his unwavering performance in the domestic competitions. Ambati Rayudu, who last played an ODI in Zimbabwe (almost a year ago) has been reinstated into the team. Kedhar Jadhav and Manish Pandey scored centuries in the last match they played for India. Resultantly, they have been included as well. Axar Patel and Rishi Dhawan will perform the dual duties in the ODI squad. Jasprit Bumrah, Dhawal Kulkarni, Barinder Sran and Jaydev Unadkat form the fast bowling armoury.